Our real business is amplifiers, but I've said it many times on this site, what you hear is the speakers. We're not in the speaker business, but we want our amps and you to sound the best possible. So, we offer speakers in support of our amplifiers. Not all speakers are created equal. Here's a look at three 12 inch speakers. The two on the left are Celestions. 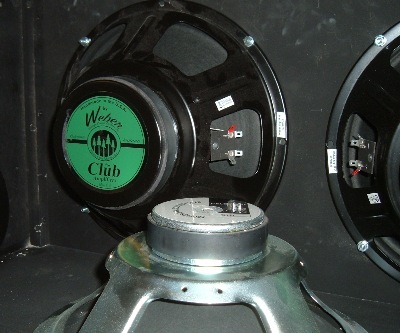 The one on the right is a Weber speaker built for Club Amps. Take a look at the magnet structures. Take a look at the Celestion in the middle. If you have a sealed back 4x12 cab there's at least a reasonable chance that what's inside is a small magnet speaker like this. They can handle the power. That's a function of the magnet, the voice coil and the stiffness of the cone suspension. But, the magnet structure and the cone are what influences the sonic signature of the speaker. A small magnet speaker will not have the great tone of a speaker with a larger magnet. That doesn't mean it will sound bad. It's hard to explain the difference. But, you will recognize the difference immediately if you hear small magnet vs large magnet speakers side-by-side. Another quick look at speakers. This is a look inside a Club cab being assembled. You see a Weber-built Club speaker attached to the baffle. sitting in the foreground is a small magnet Celestion of the type found in many economy 4x12 cabs. Take a look at the magnet structures. There's a complex balance associated with speaker design. The magnet structure is an important influence in the tone or sonic signature of the speaker. Generally speaking, bigger is better. Speakers are interesting contraptions. The surround, the part that holds the outside of the cone to the frame, and the spyder that holds the "small" end of the cone to the frame act like a springs trying to keep the cone from traveling too far (and damaging itself or the voice coil). The voice coil and magnet structure are trying to make the cone move back and forth and make "noise". In the case of guitar amplifiers that noise is often a "big noise", so big that it can damage the speaker. Speakers with high rated power handling have very big magnet structures and large voice coils, both to manage the cone movement and to dissipate heat. They also have very "stiff" surrounds and spyders. It's always a balancing act. The stiff surround actually keeps the speaker from being loud or articulate at low levels in the process of keeping it from destroying itself at high power. And, then there is the cone itself. The diameter, material, curvature, ribs or lack-there-of and the dust cap all have a very big influence on the lows, the mids and the highs and how they propagate through the air. Many contemporary speakers have high power voice coils and magnet structures to handle the punishment of 50W to 100W+ amps. Yet it was 20W-50W speakers from Jensen, Oxford, Utah and CTS and 20W and 30W speakers from Celestion that gave us the classic sounds that are the "standards" of classic electric guitar. One of the reasons for 2x10, 2x12, 4x10 and 4x12 speaker configurations was to let each of the speakers share the power from the amplifier. The standards for speakers have changed with high power amps and intentional overdrive. Eminence and Celestian are probably the volume leaders in guitar speakers these days. They have understandably brought out speakers with high power ratings to accommodate (and survive) the 100W amps and overdrive styles that have become so common. 1 x 10 enclosure with selected Weber, Celestion, Eminence and Jensen speakers....not always in stock. Usually available in 10 days to 2 weeks. 1 x 12 enclosure with selected Weber, Celestion, Eminence and Jensen speakers....usually in stock. 1 x 15 enclosure with selected Weber and Club/Eminence custom, and Celestion Fullback speakers....cabs always in stock. 2 x 10 enclosure with selected Weber, Celestion, and Eminence speakers...cabs usually in stock. 2 x 12 enclosure with selected Weber, Celestion, and Eminence speakers....cabs usually in stock. 4 x 10 enclosure with selected Weber, Celestion and Eminence speakers....build to order. 4 x 12 enclosure with selected Weber, Celestion and Eminence speakers....build to order. Virtually all Club enclosures are built with 13 ply plywood (there are some exception), black tolex and silver/black weave (salt-and-pepper) grill cloth. We try to keep stock of most requested models. We will quote a price and lead-time based on the speaker(s) you specify. If you want something special and we can do it we'll quote it.